If your family is anything like mine, reading a book isn’t the first thing your child chooses to do when they get bored. I knew that we needed to make some changes if our children were going to embrace reading and become lifelong readers. The following 5 ideas that we implemented have given us positive results in our home so I wanted to share them with you. Build it into your schedule ~ This may be the single most important step that you can take. Children love schedules, predictability, and routine. A very impactful step in getting them to read more is to build reading into their schedule. For us, reading time is between baths and teeth brushing right before bed. Quiet time reading is a good way to wind down before bedtime. When they understood the predictable schedule each night the complaining ceased, and the routine began. Monkey see – monkey do ~ Children that grow up seeing their parents read for fun, will read for fun themselves. Whether you read books, magazines, or blogs they are watching and learning from you. A great way to implement this one is to read when they do during your daily quiet reading time. 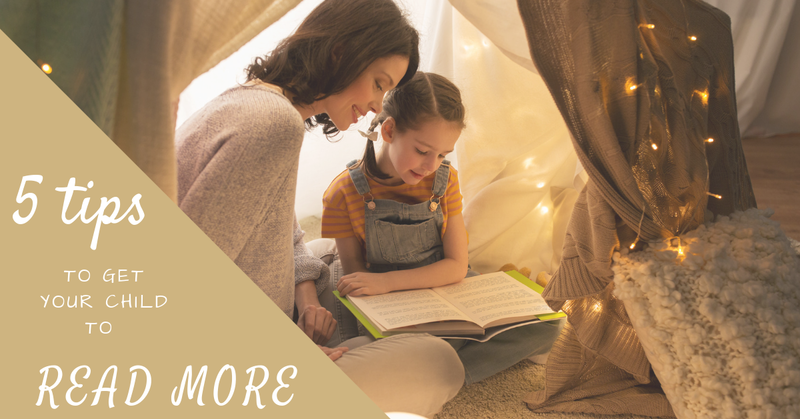 Don’t forget to read out loud to them ~ Even if your children are old enough to read to themselves it is still a great idea to read out loud as quality family time. Our children vary in age range and we find that classics like Grimm’s Fairy Tales keep everyone in the family engaged and interested. Bring books to life ~ Our children read more when they are reading books on topics of interest. Taking your children on interesting outings or trips can spark an interest for them on a variety of topics. If your toddler likes books about farm animals take a trip to a local farm to see them in person. If your child likes to read about dinosaurs, a trip to a museum may be a great reinforcement. Create a cozy reading nook ~ Choose an area in your home that is the designated reading nook. Comfy furniture, blankets, lighting, shelves, and a variety of books will make this area appealing to be in. For smaller kids I recommend a fort or tent that lets their imaginations to run wild! Reading out loud to kiddos is so crucial… I always stressed this when I was teaching. I can still remember my mom reading to me every night before I was able to read. I then would read to my brothers. They are fond memories. I make sure to read to my niece whenever we have her. She is old enough to read on her own now, but still loves when I read Harry Potter illustrated books to her before we go to sleep. Oh I love this. Since my husband and I want to start our family soon I am saving it because it is so important to me that our future children be good readers. Reading is vital to every child and adult. Reading can take you to places you can’t afford! My daughter has always loved books and Im blessed to have never had a problem getting het to take time to read. We have a reading tent and our girls love it. Bedtime stories is one of their favorite things! Cora is getting so excited to start reading, it’s so fun to watch. Routine is super important! I read to my kids before nap and bedtime and it’s an easy way to get them to their rooms so they can pick a book! My baby is only six months but I read to her every day! These are such great suggestions! I’m an avid reader and hope my kids will be, too. My daughter loves when I read to her, but she has no interest in learning to read! Great suggestions!